Concinnity is held in the Cudahy Student Center, located on the 3rd Floor of the Milwaukee School of Engineering's Student Life and Campus Center Building at 1025 North Broadway, (downtown) Milwaukee, Wisconsin (53202-3109). Take I-43 south to downtown Milwaukee. Then take Highway 145 east/McKinley Avenue exit (exit # 73A). Turn left (east) on McKinley; proceed for about six blocks. Turn right on Broadway to MSOE’s Student Life and Campus Center. Take the elevator to the third floor. Take Highway 41 south to Milwaukee; then take I-94 east to downtown Milwaukee; then take I-43 north toward Green Bay (exit # 310B; then take Highway 145 east/McKinley Avenue exit (exit # 73A). Proceed on McKinley for about six blocks. Turn right on Broadway to MSOE’s Student Life and Campus Center. Take the elevator to the third floor. Take I-94 west/I-43 north to downtown Milwaukee. Continue north on I-43, then take Highway 145 east/McKinley Avenue exit (exit # 73A). Proceed on McKinley for about six blocks. 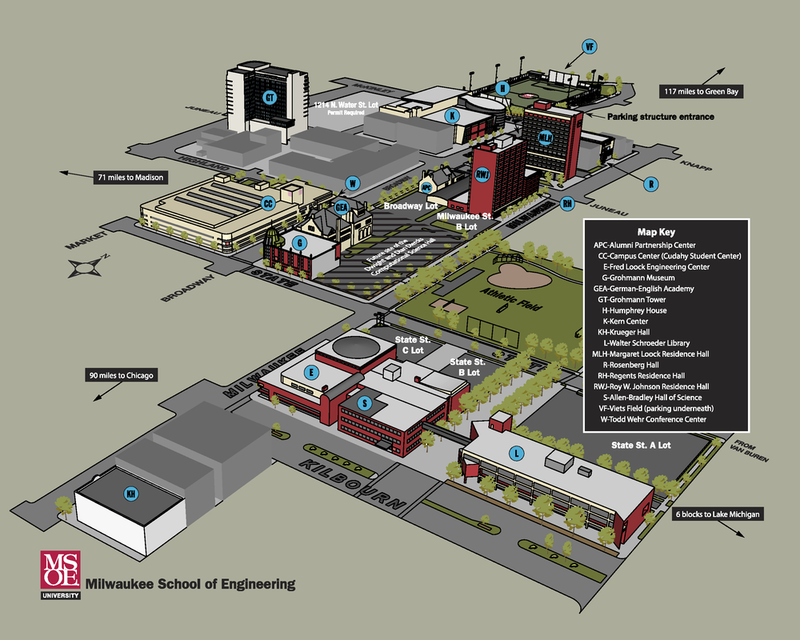 Turn right on Broadway to MSOE’s Student Life and Campus Center. Take the elevator to the third floor. Take I-94 east to downtown Milwaukee; then take I-43 north toward Green Bay (exit # 310B); 794; then take Highway 145 east/McKinley Avenue exit (exit # 73A). Proceed on McKinley for about six blocks. Turn right on Broadway to MSOE’s Student Life and Campus Center. Take the elevator to the third floor. Take Highway 41 south to Milwaukee; then take I-94 east to Milwaukee. Take I-94 east to downtown Milwaukee; then take I-794; exit Jackson/Van Buren (exit # 1E). Proceed north on Van Buren Street seven blocks to State Street; turn left. Follow State Street to the specific building or parking lot on campus. Take State St. to Broadway.Turn right on Broadway to MSOE’s Student Life and Campus Center. Take the elevator to the third floor. Additional parking is available in the Viets Field parking structure (located at the "VF" above), where parking is $5 for the day. Parking is also available on the street for free on the Saturday of the convention, but the posted (often two hour) parking limits are still in effect. There are also nearby parking structures that charge a reasonable fee.